Rick Hetzel’s premier divot tool fits right with his clubs. 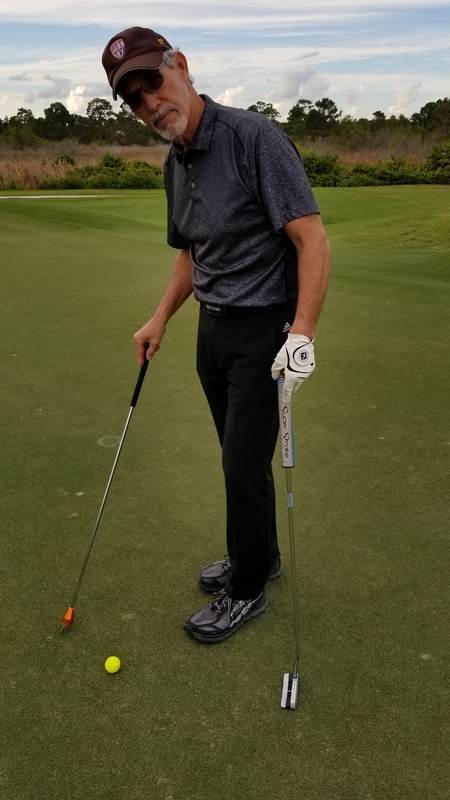 When it comes to analyzing the latest in golf equipment I tend to defer to Jason Bruno, my Florida golf website partner who is a scratch player. I’m clearly not. Bruno, the creator of the LinksNation website, and I had a catch-up round this week – our first since I returned from the Chicago area in September. We played at PGA Golf Club’s Dye Course along with Rick Hetzel, the president of InstaGolf LLC. The company, based in Hetzel’s hometown of Cape Girardeau, Mo., specializes in golf accessories. Its products, sold predominantly on line, include shoes, putters, towels and rain gear. His offerings are certainly fair game for me to analyze as well. You don’t have to be a scratch player to analyze them. I quickly became interested in all of Hetzel’s products, but divot tools in particular. There are so many of these — from so many manufacturers — on the market. Hetzel himself has four different models. The one that intrigued me the most was his SPIDERPro. If you have a bad back, this one is for you. You don’t need to bend down to repair a divot if you have a SPIDERPro. It fits into your golf bag like an extra club. If one of your shots does damage to a putting surface you pull out the SPIDERPro, unscrew the top, poke the stainless steel legs on the exposed end into the divot and watch it disappear. Hetzel’s divot tools come in more standard looks as well, and he reports that all have been well-received by golf course operators.